Motorola MC9000-G Series with RFID. 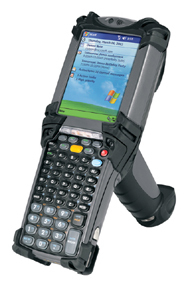 The MC9000-G with RFID from Motorola is a ruggedized mobile computer that features integrated support for the most popular radio frequency identification standard EPC, the Electronic Product Code. By integrating support for either EPC Class 1 or Class 0 RFID reading and programming with a robust commercial mobile computer, the MC9000-G is able to offer an unparalleled level of functionality suitable for a broad range of RFID applications. Combining RFID, bar code reading, imaging, 802.11 connectivity, a full 1/4 VGA screen and alphanumeric keypad, the MC9000-G with RFID has the flexibility to give your organization real-time access to mission-critical information from key points in your supply chain. Enterprise-wide management and control of the MC9000-G is easy with Symbol's Mobility Services Platform (MSP). Reduces user fatigue in scan-intensive applications. Delivers high-speed CPU performance for robust enterprise applications, including multimedia.